Below are helpful tips on serving and storing your Vanilla Bake Shop sweets and answers to our most commonly asked questions! 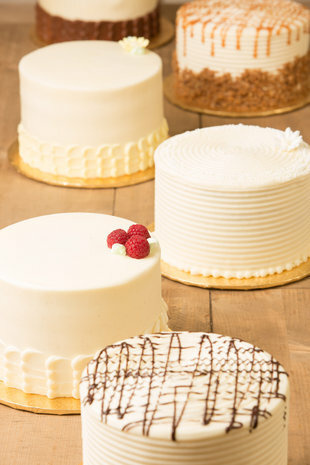 How do I serve and store my fruit filled and whipped cream filled buttercream cakes? -All fruit filled and whipped cream filled cakes should be refrigerated. -Remove from refrigerator 45 minutes before serving so buttercream has time to soften to room temperature. -Do not leave whipped cream filled cakes out for longer than 2 hrs. -Do not leave fruit filled cakes out for longer than 4 hrs. How do I serve and store my non fruit & non whipped cream filled buttercream cakes? -Keep your buttercream cake chilled until 45 min before serving so buttercream has time to come to room temperature. -We use real butter, which can get soft very easily, just like a stick of butter does. If a buttercream cake sits out of the refrigerator for longer than 4hrs, it may soften and start to settle creating an exterior that is not as smooth. It will still taste great, but it may not look as smooth. -For clean slices, keep your cake knife in a pitcher of hot/warm water between slices. It will help give clean, sharp edges with each slice. -Keep cupcakes at room temperature. -Cupcakes taste best when eaten the same day they are purchased, but if you need to store them over night, enclose them in an air-tight container at room temperature. - We use real butter, which can get soft on warm days and not travel as well. 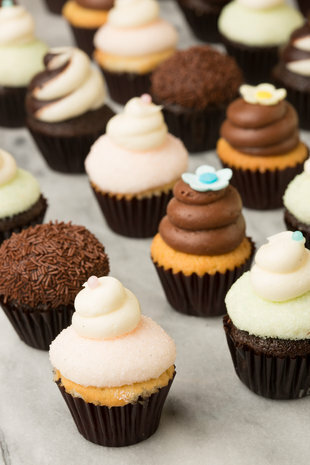 We recommend chilling your cupcakes 1 hour prior to traveling to firm up the buttercream, which will help to keep them looking perfect until you arrive at your destination. -Refrigerate cupcakes that are stuffed with whipped cream or fruit filling. How do I store my icebox desserts, tarts, cheesecake & french macarons? -Keep icebox desserts, tarts, cheesecakes, and French macarons refrigerated. -Can store for up to 2-3 days. -Do not leave icebox desserts, tarts, or cheesecakes out of refrigerator for longer than 4hrs. How do I store my cookies & bars? -Should be kept at room temperature or re-warmed on a cookie sheet in an oven set to 300 degrees for 1-2 minutes before serving. -Cover tightly in an airtight container if storing over night. Do you deliver? Yes, we offer local delivery in the Los Angeles county area. We may travel farther for your special event. Please inquire with a VBS catering coordinator. Do you ship? At the moment we dont offer shipping. Do you do custom cake or cupcake designs? Yes! Our highly skilled cake designers are professionally trained and have many years of experience in cake decorating. We welcome ideas and suggest bringing inspirational materials such as your event invitation, magazines, pictures and color swatches to create your perfect cake or cupcake design. Can I have a white exterior even if my cake is chocolate? Yes, we can coat the exterior in vanilla bean buttercream or cover it in white fondant and the interior will be chocolate. Do you offer wedding favors? Yes, we do french macaron favors, cookie favors and cupcake favors. Submit a consultation request or email Events@VanillaBakeShop.com for more information. 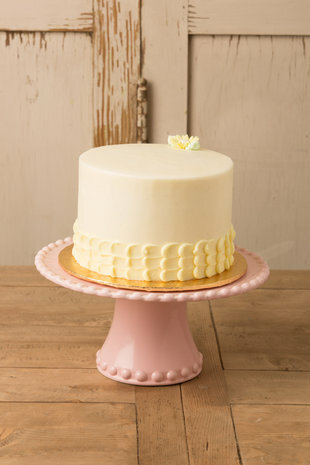 Do you make dummy cakes with faux tiers? Yes, we can create your cake using dummy tiers for added height. We charge $2 less then the price per slice would be for a real cake. Are any of your products gluten-free?Yes, we have gluten free Red Velvet cupcakes on Fridays and all of our French Macarons are gluten free. Are any of your products dairy free? No, we use butter or cream in all of our desserts. How long will my cupcakes last? 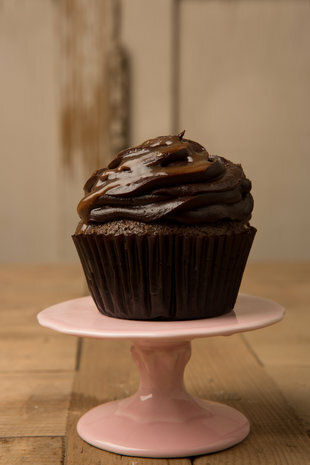 All our cupcakes and cakes are baked fresh from scratch with no added preservatives. They are best enjoyed the same day. You may wrap them in an air tight container and enjoy them the next day as well. Do your products contain nuts? We do have nuts in our bakery, so there may be traces of nuts in our products. Do you have any sugar-free products? Not at this time. How far in advance should I order? For weddings we suggest 6-8 months in advance. Standard cakes- 48hrs, Cupcakes- Same day, Large or Custom orders require more notice. Do you have dessert displays to rent or purchase? Yes, we offer cupcake tower rentals and dessert bar rentals. Please email Events@VanillaBakeShop.com for more information. We also sell disposable cupcake towers for smaller events. Can Vanilla Bake Shop donate to my charity? Please email donations@vanillabakeshop.com at least one month prior to your event. Vanilla Bake Shop donates to 501(c)(3) charity organizations only. Due to the significant number of requests we receive, we are sorry we are unable to personally respond to every request.